At the Rossville Volunteer Fire Department, we strive to maintain high standards of training and practice of fire fighting skills for your protection. Fire Meeting – 1st Tuesday of month at 7:00 p.m.
Training Meeting – 3rd Tuesday of month at 7:00 p.m.
used a 1917 Model T Ford truck equipped with soda acid tanks. Switchboard operators would dispatch the fire truck. They would ring a large bell atop what is now the Rockwood Building during an emergency. J. Frank Maish loaned a bell to the department. The Rossville Baptist Church had previously used the bell to call worshipers to service. The Rossville Volunteer Fire Department was organized in 1938. At that time, there were 12 volunteers and had acquired a new 1938 Chevrolet pumper. The front garage of the Rossville Opera House was used to store the new pumper. The fire bell was later replaced by a siren in the early 1940’s. Switchboard operators continued to dispatch emergencies. In 1948, the department began providing service to the townships of Ross, Owen, and Clay. During this same year, a 1948 Chevrolet pumper was added to the department. In the 1950’s a tanker truck was put into service for additional protection for the townships. In 1968 the former Opera House was remodeled and the Rossville Fire Department became a corporation. The 1938 pumper was replaced by a 1969 pumper. In 1980, the 1948 pumper was replaced by a 1980 pumper. 1980 pumper, and twenty volunteer fire fighters. In 1997, the 1969 pumper was replaced by a 1997 model. In 2001, a 1981 rescue mini pumper was added to replace the 1978 van. additional funds from the Town and the townships, a Cascade Breathing Air System was added. St. (St. Rd. 26). All department vehicles can now be housed under one roof. The volunteer fire fighters provide around the clock protection and are dispatched using a pager system. The dispatcher is supplied by the Frankfort Fire Department. 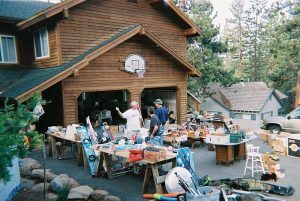 Garage Sales are being held at various locations throughout the community. Maps are available at the Town Hall.